Sight, sound and motion have long been the Holy Trinity of Madison Avenue’s sensory perception — and of TV’s and video’s dominance of advertising formats — but new research from Interpublic’s Media Lab and Magna units touches on a fourth sense that may be an even more effective and engaging one: touch. The research, which was based on tests of a series of “touch-enabled” video ads — ads that produced tactile haptic feedback enabling users to literally feel them — found that they generated a 50% lift among consumers for the brands participating in the study. The findings, which will be released in a report, “Ads You Can Feel: The New Mobile Experience,” were based on a study of haptic feedback enabled pre-roll Web video ads using technology developed by Immersion Corp. for four brands — BMW, Royal Caribbean, Arby’s and Truvia — that were experienced by a panel of 1,137 Android users. The full sensory experience is best observed by viewing the ads while holding a haptic-enabled mobile device, but if you watch the [0:32 minute] video of the ad created for Arby’s you’ll get the idea — just imagine your phone actually reverberating when the announcer’s deep-throated voice resonates or when pro golfer Andrew “Beef” Johnston pitches a ball into an Arby’s cup producing a trademark kerplunk sound that also vibrates as the cup tilts over. The study found that well-executed haptic applications increase a viewer’s engagement with an ad, but also boost the toucher’s sense of connection with a brand in the most literal way, yielding emotional connections — especially “happiness” and excitement. Standard versions of the video ads tested achieved happiness and excitement levels of 37% and 30%, respectively, while versions enhanced with haptic feedback generated rates of 44% and 38%, respectively, for the same emotions. Interpublic said the haptic versions also generated a “halo effect,” boosting perceptions among consumers that the brands were also exciting by 6%. Haptic technology creates a more emotional experience, leading to consumers feeling more “excited” and “happy” during ad exposure. Engaging the sense of touch drives a 62% increase in feelings of connection with the advertised brand, which is often very difficult for marketers to do. Ultimately, adding haptics to video ads leads to a 50% lift in brand favorability, which equals 68% cost savings over the cost of increasing brand favorability using ads without haptic technology. Effectiveness of haptics spans across standard demographics, even driving purchase intent among the hard to influence (potential new customers). However, it’s important to note that early tech adopters are especially responsive to ads enabled with touch technology. 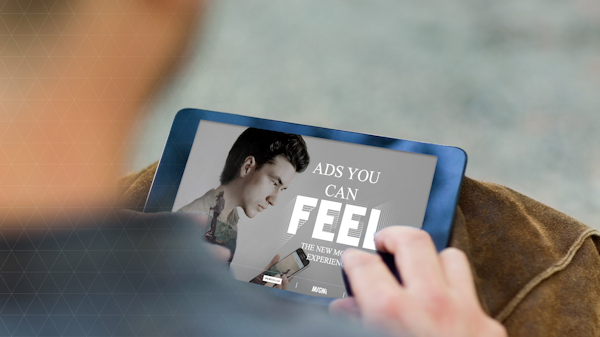 Notifying consumers up front that the ad is enabled with touch technology. More specifically, using a notification without branding from the advertiser, so as not to provide an ad prompt before the ad itself has a chance to engage consumers. Don’t overdo it. Less is often more when it comes to this new technology. Don’t overwhelm consumers with overly high levels of haptic feedback. In conducting the media trial, a total of 1,137 Android users were recruited from a representative online panel and were asked to take a mobile survey. The survey directed participants to a media experience of their choosing, where they were able to view a webpage and watch video content. Each participant was randomized into a test cell that determined what type of pre-roll ad appeared prior to the content. Passive data collection took place during the ad experience, such as completion rates, time in view, etc. Afterwards, participants completed a survey that measured traditional branding metrics and qualitative feedback.